A new 21st century individualism is overtaking "corporation-as-king" capitalism, transforming the way we work and live. Today, real power rests in the hands of creative individuals like Bill Gates, Warren Buffett, Oprah Winfrey, and Steven Spielberg, who are changing the world one great idea at a time. In THE 80/20 INDIVIDUAL, Richard Koch reveals the secret of their success: they discovered what they do better than anyone else and rode it for all its worth. 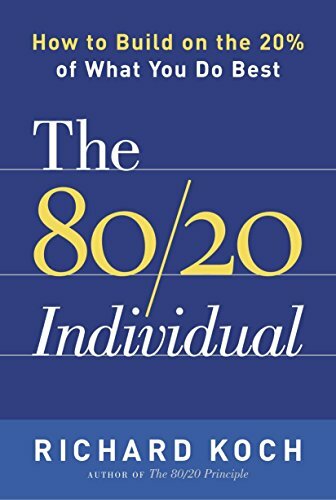 In this inspiring sequel to his classic bestseller THE 80/20 PRINCIPLE, Koch shows how to maximize success in your career and life by using the proven principle that 80 percent of changes in the world result from the most powerful 20 percent of actions and ideas. He'll show how to use your own powerful "20 percent spike" - your most creative ideas and unique skills - to measure the amount of value you bring to your employer, clients or customers. For most people, there is a huge disparity between their intrinsic value and the compensation they receive for their efforts. THE 80/20 INDIVIDUAL shows how to narrow that gap. Drawing from his own success as an entrepreneur, as well as from the stories of scores of companies and individuals who have flourished as a result of an 80/20 mind-set, Koch offers a step-by-step method to remodeling a career or existing business, or creating a new one - one that most benefits you. He provides valuable insights on finding 80/20 partners, hiring 80/20 employees, and running an 80/20 business. By building a team that supports your efforts and excels in areas where you lack experience or knowledge, you'll be able to focus your time and energy on your strengths. Productivity and profits will soar because you'll be doing what you do best and enjoy the most. By using the 80/20 strategies outlined in the book, you can take control of your career and financial future.